Winter is truly a wonderful time of the year. During this time, family members get together and exchange presents. They feast over great food. However, this season can be a living hell for the hair. The dry air and low temperatures can strip away the moisture from your strands, leaving them brittle, dull, and looking lifeless. In winter, static can be a major problem to your hair as well, especially if you love to wear hats or spend most of your time in an indoor environment. Why? Whenever hair dries out, it picks up static charges. Under normal weather conditions, most of these charges are absorbed by the water molecules that are freely floating in the air. Unfortunately, the dry winter weather does not allow the static charges to dissipate properly, causing your hair to frizz up quickly. As a result, you find yourself always in a never-ending battle against fly-away strands and wisps. The good news is that there are many things you can do to protect your hair during the winter season. Switching to a moisturizing shampoo is one. But the key is basically to use the right products and following proper hair care routines. We’ll teach you more about this in our coming posts. A good hair care routine begins with the scalp. Do you know why? Aside from having individual hair follicles, the scalp is covered with lots of sebaceous glands that cannot be seen by the naked eye. In case you don’t know, these glands are responsible for producing the healthy oils that moisturize and nourish your strands. Once your scalp becomes irritated and dry, these glands stop working, causing your body’s sebum supply to dry up and your hair without its natural protective coating. If this continues, the hair may eventually become dry, brittle, and lifeless. It will also trigger the formation of visible dandruff. Even worse, the absence of sebum is associated with the formation of split ends. 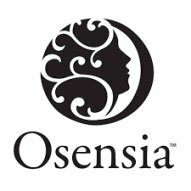 Luckily, professional brands like Osensia have formulated a variety of shampoo products that are designed to nourish and moisturize the scalp. Most of these products are paraben-free and are made of natural ingredients that work to keep the balance of the natural oils needed by the scalp. 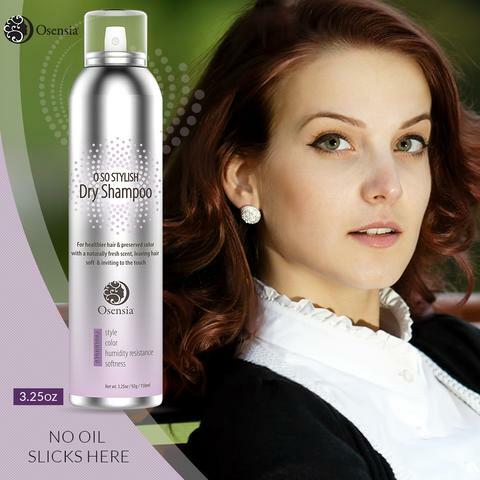 One particular product that Osensia has for dry scalp is the O so Stylish Dry Shampoo. It deodorizes and cleanses the scalp without leaving a trace of chalk or any dulling effect. By adding these scalp-care products to your hair care routine, you can help reduce the chances of split ends formation and combat dull and lifeless hair. We are probably used to washing our hair with our favorite shampoos. But did you know that switching shampoos according to the season is also a good idea? If you feel that the winter season is just around the corner, experts suggest that you use a shampoo that is formulated to repair damaged hair, control frizz, and moisturize hair than a shampoo designed to volumize or chelate. Chelating shampoos contain stringent chemicals that actually do a great job at cleaning the hair. However, they only get rid of the natural oils that are essential during the cold weather. Volumizing shampoos, on the other hand, clean lightly, which means they lack the hydrating compounds that are vital for hair care protection during the cold days. That said, it is very much recommended to use a shampoo that is specifically formulated to control frizz and reduce the effects of damage. So how do you tell if this shampoo is what you are looking for or not? In most cases, this shampoo is formulated using ingredients like Argan oil or keratin and other ingredients that repair the effects of damaged caused by strong winds and cold weather. 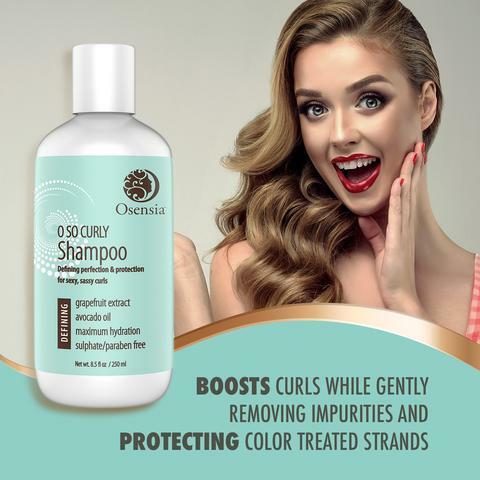 Hydrating shampoos like O so Curly Shampoo from Osensia make a great shampoo choice for the winter season. This is designed to provide a new layer of protection for the hair, which helps seal in moisture and keep hair looking beautiful and sleek. If you can add hydrating shampoos to your hair care regimen and reduce the total number of washes every week, you can effortlessly keep your hair look well-nourished and full of life. Dry shampoos may sound like an odd thing to add to your winter hair care routine, but they actually are great alternatives to the usual liquid shampoos we use. Here’s the science why dry shampoos are sometimes much better than their liquid counterparts. The process of washing hair with water and shampoo can instantly strip away the natural oils in the hair. Though hydrating shampoos can counter the effects, minimal weekly washes still have an obvious advantage. We're not suggesting that you forget about shampoos completely. What we are saying is that you should not wash your hair regularly with liquid shampoo, and then, every now and then, wash your hair with dry shampoo. That should be more than enough to stress out the effects of using an effective shampoo. And if you can reduce your total number of washes and opt for a dry shampoo once in a while, then the better. 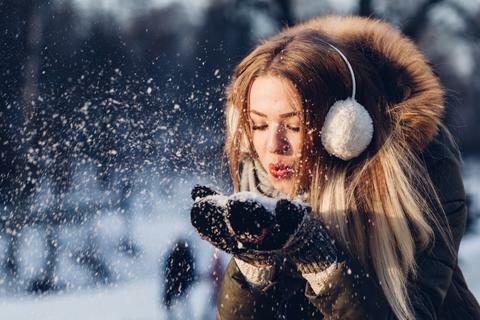 You should be able to maximize your hair’s natural protection and keep your delicate follicles from being wreaked havoc by the harsh winter weather. If you buy the right shampoo like O so Stylish Dry shampoo, then you can help keep your hair looking great, full, and voluminous. So, if you care for your hair enough and want to retain its glory, consider using this product. Experts would usually recommend using dry shampoos in between washes, but know that they can be used to bring life to hair that looks dull and flat. They're even a great product choice for Christmas parties. As we keep on emphasizing on this post, the winter weather is undeniably good at turning a well-groomed hair into a total mess. Frizzy curls, split ends, and fly away strands are just normal during the cold weather, and sometimes, you find yourself in a constant battle against maintaining shine. Lucky for us, a good hair conditioner can fix the above problems, especially if it is used alongside hydrating shampoos and scalp treatments. Conditioners are mostly formulated to nourish and smoothen hair, lock in moisture, fight frizz, and keep the strands looking sleek and gorgeous. In addition, modern-day conditioners already have ingredients that work to repair damaged strands and have properties that can bring life to dry and dull locks. It's no surprise why they’re considered an excellent choice for those who want to retain healthy, vibrant locks throughout the winter season. Now, what makes a good hair conditioner for winter? According to experts, you have to check out for products that are designed to tame frizz and hydrate the hair. Moisture repair conditioners make great bets as well because they are formulated to strengthen and smoothen damaged hair. To help you better decide, choose hair conditioners that are formulated to smoothen cracked cuticles because they can actively protect even the most delicate parts of the hair. By simply adding natural hair conditioners to your hair washing routine, you can bring your hair to a silky-smooth path, regardless if it’s a cold, below zero, winter month. Are you struggling with damaged or dry hair? If that is the case, you might need to try on a hair mask. It's not something that you literally put on to your hair. It is simply a powerful treatment that acts like a super-charged hair conditioner, which sends out oils, natural extracts, and nutrients, deep into the shafts. When days are cold, hair stylists advise the use of hair masks as they help reverse the effects of winter damage. Don't worry because they are very easy to use. As a matter of fact, they can be instantly worked into freshly washed hair. After which, they are left on for about 10 to 20 minutes. Once they have had nourished, conditioned, and hydrated the hair, it’s just a matter of rinsing away the excess serum. Next, apply your favorite hair conditioner. After a week, you should notice the difference in your hair, especially if you are battling with brittle hair. You need not use hair masks regularly. Remember that one application can have lasting results. If you choose to use a hair mask, visit the salon or ask an expert to do it for you. The winter weather could be too much to handle for your hair. However, it does not have to be a reason for you not to care for your hair. It should rather be a reason for you to pay close attention to your hair health and its needs. We hope that the tips we rounded up above can help you winter-proof your tresses and keep it looking lively and full throughout the season. Do you know other hair care tips or hacks? Share them with us! We’d love to hear. Let us know in the comments section below.